Going all the way up to WeHo for a pizza sounds very ridiculous. In fact, I would avoid anything west of La Brea. This place was what I heard as the best pizza in all of LA. In essence, I gotta go check it out why this pizza joint is that popular. The pizzeria is located in the plaza between Santa Monica Blvd and Melrose Place (yeah, I checked it out…there’s no love triangle or any drama in that street. So bland!). On that particular stretch of La Cienaga Blvd is full of galleries, high end antique shops, and other very posh shopping spots that seemed to cater to deep pocket players. In many ways, you would never suspected this pizza place to be located along with them. Going inside of Vito’s, you will encounter a massive impressive display of pizza samples where you probably wagged your tongue by the look of those pizzas. The pizza size comes only in one size which is their 18 inch pie that will be cut into 8 slices. Forget about asking for personal size or medium size as they do not exist. Our group ordered two of their most requested pizzas. It seemed to be that the Terra Ferma (the works!) and Pizza Margherita are the two most commonly requested orders. The Vito’s Terra Ferm which is deluxe pizza with everything on it. 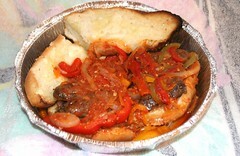 It is loaded with sausage, pepperoni, olives, peppers, onions, and mushrooms. 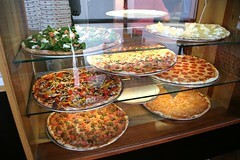 The look of the pizza can be very busy as it is over stocked with toppings. For me, I love it just because of the fact I like to create a pizza sandwich by folding in half so it doesn’t bothered me if it’s too much topping. The Pizza Margherita is one of the best pizza I had taste in a long while. It’s like a simple cheese pizza with tomato, basil, and mozzarella cheese. It is very fresh and simple as they claimed on their menu. The place is not very big with about half dozen tables on the inside with a few more tables on the outside. We have one of the coolest server that ever served us. Tony the manager was entertaining and delightful for the whole afternoon. Some others had mentioned to me about the loud east coast bantering will exist in this place. Especially with Paulie manning the kitchen where he also would obliged with a couple of his own shoutouts. They are both very accommodating and a friendly face to welcome their guests. Needless to say, the pizza exceeded my expectations. Granted, i don’t have too many New York style pizzas nor have I ever been to New York, but I can tell you that it’s probably one of the better pizza I had ever tasted. I was impressed on the fact that the crust was not greasy and the cheese & toppings were very fresh and made to our likings. 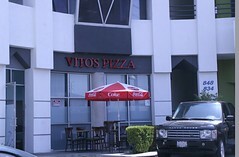 Vito’s Pizza in fact would take on all detractors to try to prove they can make New York style pizza to their liking. I have a feeling they will not lose their many of those challenges. The pizza is very quite good. In a bad way, I had a craving of it this morning when I woke up and wanted to go back for their Terra Ferma and Margherita. 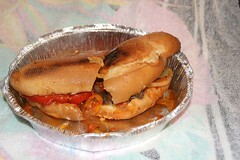 Luckily for me, I did ordered the Vito’s sandwich loaded with sausages, peppers, onions, and their special marinara sauce. That hit the spot. Besides the takeout, they do deliver within the confines of WeHo. Lucky them, but unlucky for me. What stopped me from going there again was the drive to WeHo. If they ever had a closer location, I would definitely be the first to get there. It’s better than settling for California Pizza Kitchen, which I hope their pizza DOES NOT represent California! Now I can see why the fuss for this pizza place. 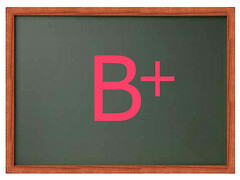 It is very good, I’ll give them that. I just hope they can maintain their quality before they get too big. Believe it or not, they still haven’t advertised this place yet and people still coming over in a busy lunch hour. That’s how popular in recent months they had become.